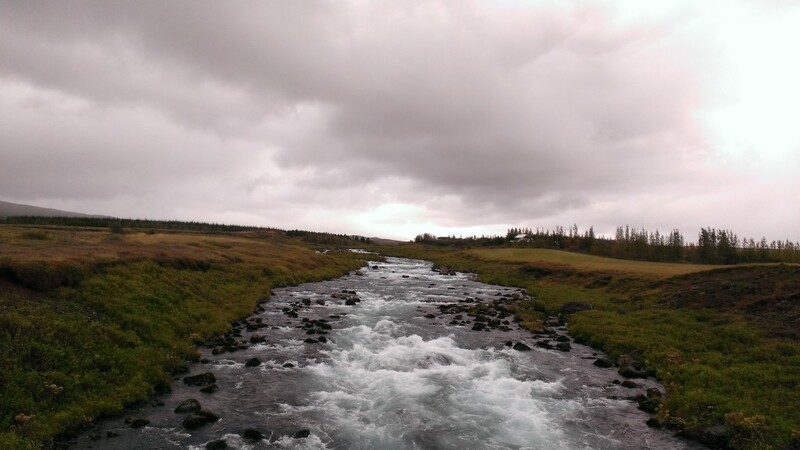 Iceland always felt like one of those faraway, once-in-a-lifetime trips that I never imagined I would be able to take. In my mind, it was like Antarctica or the Moon. It would be incredible to see, but was too far away, too expensive and too logistically difficult for anyone without unlimited means. Then my better half and I started to get bogged down in work and life and tedium. Instead of being a couple madly in love, we were living like annoyed roommates. We decided to try to reconnect by going on a trip to somewhere we had never been. A too-good-to-pass-up package deal appeared on Expedia for Icelandair flights, a hotel, and a rental car, and the game was afoot! The only downside: it was at the beginning of the off-season in Reykjavik, when summer has blown out to sea and the cold grey of winter is starting to roll in. I worried this would make for a cold, wet, miserable vacation. When travel day rolled around, we missed a connecting flight and ended up in Economy Comfort on IcelandAir on the flight from Boston’s Logan to Keflavik (Reykjavik’s airport, KEF). In a three seat row, they fold the middle seat into a table and fill it with the kind of amenities you find in Business Class on most airlines. All the Icelandic drinks and snacks you can handle are complimentary also! The menu of items served on the plane includes almost too quaint to make up descriptions of things like “served in a box you can reuse for Christmas presents.” Another Icelandair charmer is a self-service cart of complimentary Icelandic bottled water that greets all passengers during the boarding process. When we landed in Reykjavik on Friday morning at 630am local time, we headed to the rental car counter to grab our comically small compact car. We decided to immediately set off in search of adventure, worried that checking in at our apartment might lead to accidental sleeping. Our flight home was on Monday morning, so we only had about 72 hours to conquer Reykjavik and Iceland. The Amazing Race has nothing on us! Before leaving home, I had scoured the internet to create maps dotted with things we should see and do. Each map was a loop featuring different sites and routes, so we could choose an adventure each morning based on how we were feeling and what the weather looked like. I tried to give us not more than three or four hours in the car each day. First map in hand, we headed off in the direction of that famous tourist stop the Blue Lagoon. A geothermal spa of milky blue water, it almost always pops up in searches for things to do in Iceland. Based on the photos I had seen, it was obvious that stepping into the water and caking white mud onto your face instantly turned you into a young, fit and exceptionally beautiful person. I could not get there quickly enough! But first, there were a few spots along the way that we had to stop and see. 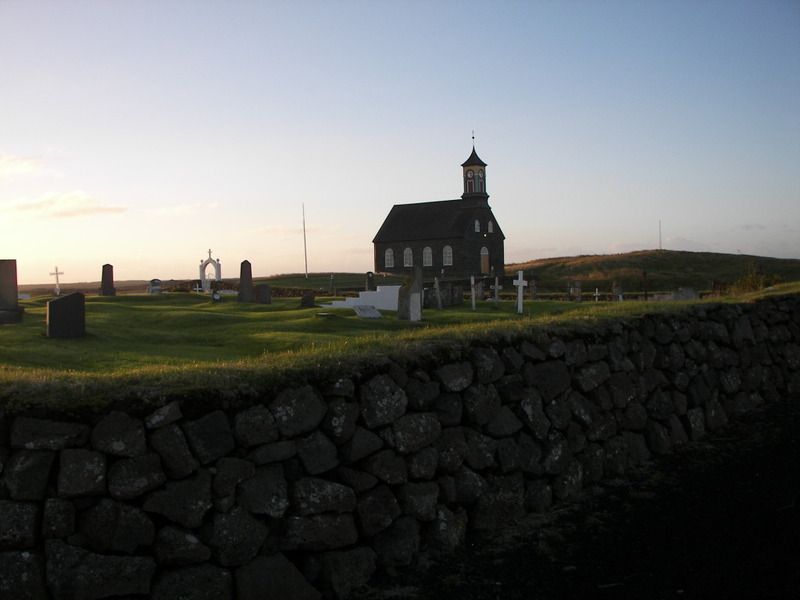 Just a few minutes into the drive from the airport, we spotted the tiny Hvalsneskirkja church and adjacent graveyard. It looked like we were in some sort of fairy tale (unintentional pun). The vastness and isolation felt like Mars. Jagged rocks littered the view as far as the eye could see, and enormous waves of the bluer-than-I-have-ever-seen Atlantic Ocean pounded the shoreline to the right as we drove away. The next dot on my map was the Bridge Between Continents, the spot where the tectonic plates of Europe and North America meet. Since I am an excellent navigator, I announced that we were about thirty minutes away from where the continents separate at a rate of a couple of inches annually. Five minutes, one brake check, and a squealing u-turn later, we narrowly avoided driving past it. The sudden realization that things were far closer than they appeared on google maps was a game changer. We took a few minutes to snap photos of ourselves with one foot on each continent, then hopped back into the car. 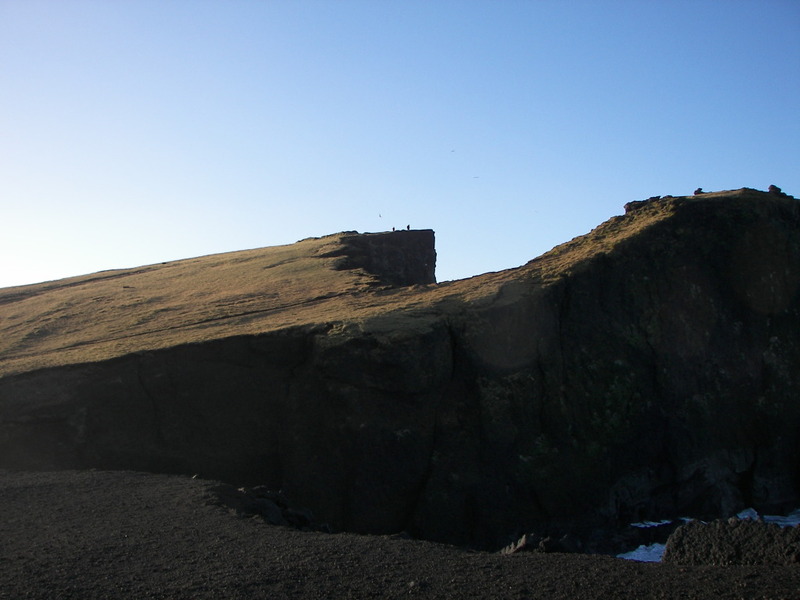 The next planned stop was Reykjanesviti lighthouse. While it’s called Iceland’s most beautiful lighthouse, more notable to me was just how far it was from the shoreline. On the horizon beyond it was a wall of grass that gradually sloped high into the sky, ending at a nearly vertical cliff edging the ocean (you can make out two people atop it in the photo, for scale). We drove over, hopped out of the car and huffed and puffed our way to the top. This was the first time we really noticed the optical illusion of Iceland’s expanse. With almost nothing recognizable to give a sense of scale, it is impossible to comprehend just how large the landscape really is. Depth perception becomes skewed. What looks like an arm’s length in the photos is a fifty foot drop. 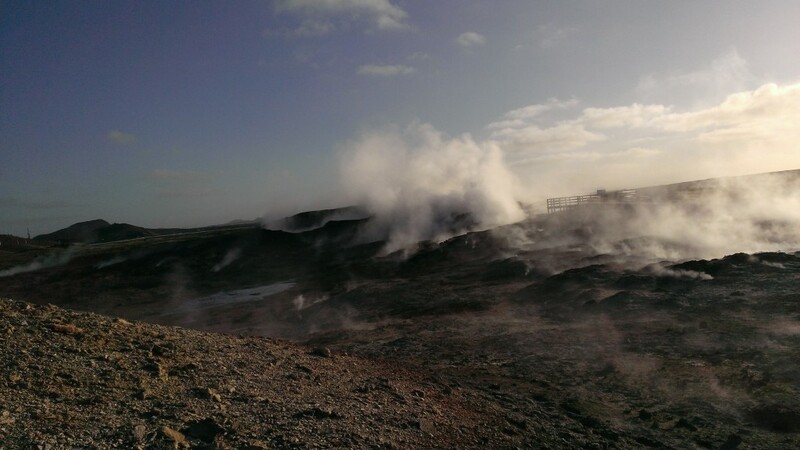 On the backside of the lighthouse, we walked through Gunnuhver geothermal area. The air was thick with the smell of sulfur and a warm mist rose from the ground in all directions. Pools of bubbling water made it look like a scene from an old Star Trek episode. Signs all around declared these puddles hot enough to cause permanent disfigurement. This, of course, basically dared us to touch it. Resisting the temptation to ignore signs and science by dipping a fingertip in the water, we headed on our way.